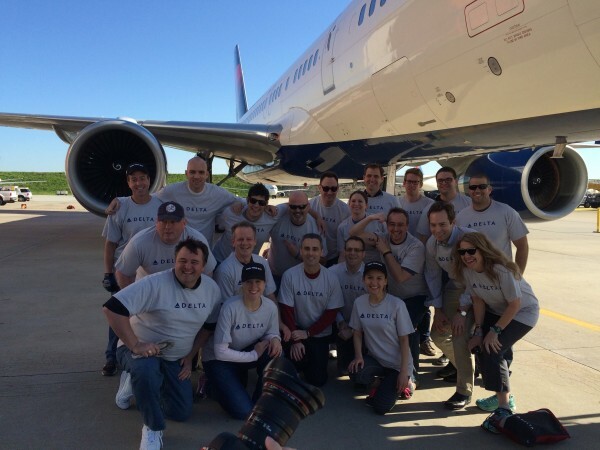 So, a group of bloggers take on an @Delta 757…..
and everybody won! Ok… maybe not, but, there’s more to the story. A couple of weeks ago, Ed at Pizza in Motion put together a team of crack bloggers, literally, titans of BoardingArea, augmented by a few other titans in the miles and points world and media. We had the one, the only, Tommy777, who most may know for taking the ice bucket challenge in the tub of a the Park Hyatt Vendome, Mr. Delta himself, Rene of Delta Points, Matthew Klint, of Live and Lets Fly, Michael W Travels, Marshall Jackson (although, I’m sure he was probably thinking of the high seas), Frequent Miler Puller who was already trying to calculate the fair trading value of the SkyPesos we’d earn from the 10 or so foot pull, Angelina Aucello, who is not Just Another Points Traveler, she pulled a plane after all, Seth Miller the Wandering Aramean, who, oddly enough, knew what time zone he was in, despite some crazy travel this month, and, because this sentence is almost as long as the rope we were pulling, I’ll keep going: Melinda Danielsen, who writes Magic of Miles, and in general, we think keeps Tommy out of trouble, Stefan Krasowski, Mr. Rapid Travel Chai (and we were really relying on the rapid part! ), Jamie Larounis, who was probably wishing he was in the Forward Cabin after the pull, Brian Cohen of The Gate, Jeanne Hoffman, the most Chic Geek of the team, Kathy Kass, who will not only run for miles, but will pull for a plane for charity! And our Anchor? I don’t know, to be honest, I was up front, but if I were to guess, I would think it was probably Ben Schlappig, who, was probably more focused on one foot at a time in this particular instance, as opposed to his normal One Mile at a Time, but it might’ve been our fearless leader, Ed “the Hashtag” (see photo below) Pizzarello, who was definitely in motion. We were further augmented by such heavyweights as Scott Mayerowitz and a couple others that, I’m sorry to say, I didn’t get the chance to chat with. Now that I’ve set the stage with the titan team, let me set the other side of the stage, our adversary. A Delta Boeing 757. Fearless when looking down upon this crack team of word wranglers. The other competition, of course, was rather concerning as well. We had heard of Samoans from Salt Lake City, and Ed had run into a pretty beefy team from Seattle. We saw some pretty dedicated teams. 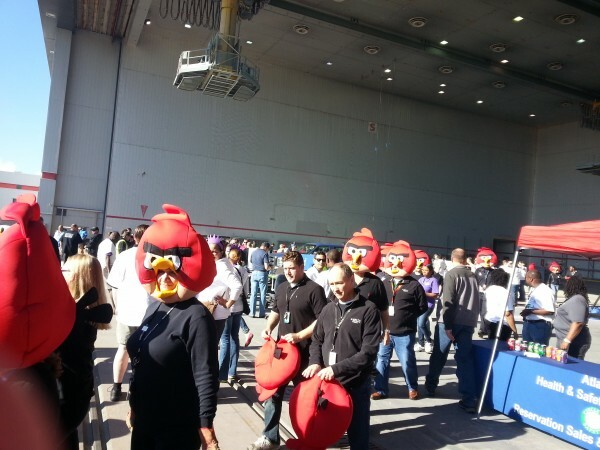 There were also some Angry Birds. 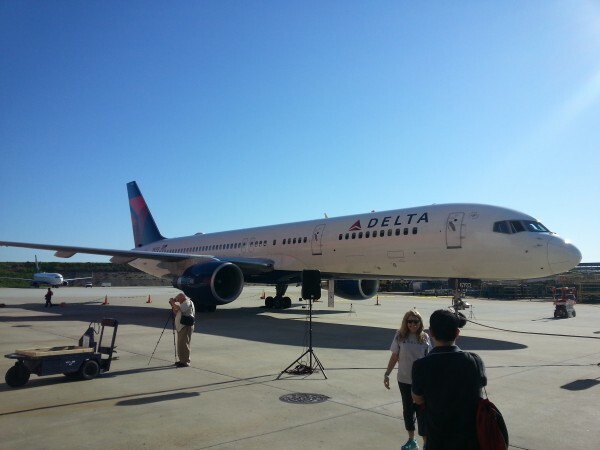 At one point, a few of us conceded, could we even move this Delta 757, which we were hoping was closer to 127,520 pounds (its empty weight), rather than its 255,000 max take-off weight. We watched a couple more teams pull the plane, in times ranging from just over 9 seconds, to as much as 16 seconds. And then it was our turn. We were able to move that bird, and it only took 12.100 seconds! According to Ed, we didn’t actually win anything in the plane pulling competition, but, if you ask me, we’re all winners, because we actually got the plane to move. Even more fortunate, the team was able to raise over $5,000 for the American Cancer Society’s Relay for Life. Now that is a win. I was wondering how this turned out. Thanks for the write up. “This sentence almost as long as the rope we were pulling…” Hahaha! Love it! @Tracy – a great time was had by all! Even better that the event raised a considerable amount of money for a great cause! Great write-up of what sure sounds like a fun time. Congrats! Thanks! I highly recommend doing it! Especially when it supports such a great cause!